Roberto Rossellini's ambitious and enormously moving follow-up to his breakthrough Rome, Open City is presented here in a new restoration. Available for the first time on DVD in the UK, Roberto Rossellini's ambitious and enormously moving follow-up to his breakthrough Rome, Open City is presented here in a new restoration. Made in the aftermath of the Second World War, Paisà is constructed as a series of seix encounters which take place during the liberation of Italy as Allied troops advance through the country from Sicily to the northern Po Valley, via Rome and Florence. Shot on location using a non-professional cast alongside actors, the semi-documentary aesthetic and epic sweep of Paisà is both charming and devastating in its portrayal of the final days of war and confusion that follows in its wake. 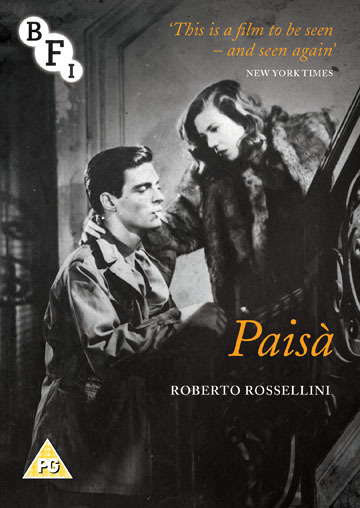 This classic of neo-realist cinema forms the centrepiece of Rossellini's acclaimed War Trilogy and was followed in 1948, with the celebrated Germany, Year Zero.